As the NFL’s response showed, there’s a lot at stake here, with independent shoe customizers threatening advertising dollars and big deals. Earlier this year, Nike, which has a lucrative merchandising deal with the NFL, threatened to terminate the contracts of players wearing custom designs that obscured their swoosh logo. Nike also sent numerous cease-and-desist letters to Miami-area shoe customizer Marcus Rivero, who made Lynch’s gold footwear along with one-of-a-kind kicks for other players under the name Soles by Sir. Perhaps predictably, Rivero has only benefitted from Nike’s attention. When Nike rival adidas recently started outfitting the Miami Hurricanes, they promoted the deal by tapping Rivero to design custom cleats for ‘Canes alums now playing in the NFL. He also found that by highlighting corporate branding rather than obscuring it, he could get the corporate shoemakers to leave him alone. While Rivero has reportedly designed special cleats for six players participating in the Super Bowl this year, Nike and its affiliate Jordan Brand actually bear much of the responsibility for creating this current custom cleat craze. The brand basically invented the idea of rare, colorful kicks, and frequently making special gear for both pro players and college teams like the Oregon Ducks. 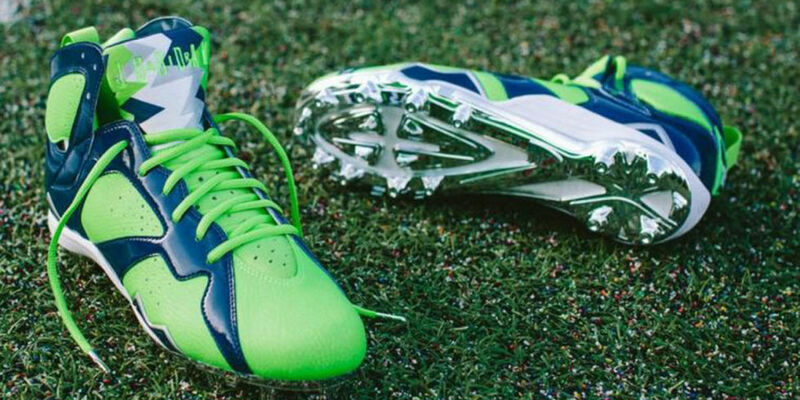 Recently, Jordan Brand revealed the one-of-a-kind cleats that Seahawks safety Earl Thomas plans to wear when he faces the Patriots on Sunday. With silver plated spikes set beneath fluorescent green uppers offset by patent leather highlights, they’re just as garish and awesome as anything Rivero’s made. No matter who comes out on top here (we’re betting Nike, but kind of cheering for the little guys like Rivero), the fans and uniform watchers are real the winners, as crazy cleats and other stylish touches make following football just that much more fun.